An Absolutely Remarkable Thing is seriously… remarkable. This book was ridiculously fun and I got through it in a day. It’s one of those books where you’re ready for a sequel the moment you finish it. Let me start with the negative; this was a debut novel and, of course, has some flaws. For starters, holy heavy-handed delivery of the moral, Batman. This book is not subtle in how it deals with the concepts of xenophobia, partisanship, and extremism. These themes were woven pretty seamlessly into the narrative itself, and they weren’t helped by the main character monologuing about them straight to the reader. Hank Green, please realize that your audience can get your message loud and clear without you beating them over the head with it. April is 23 years old and a recent college graduate at the start of the story. She is thrown into the spotlight accidentally and isn’t really equipped to deal with it. While the specifics of her situation are extraordinary, I feel like a lot of younger Millennials and older Gen Z kids will relate to her. April’s struggles mirror the way a lot of us feel about adulthood in general. I also really liked the way Green used April’s character to tackle the issue of biphobia, which is something rarely addressed in fiction; more often than not, it is simply lumped in with homophobia if it’s directly addressed at all. But the fact is that biphobia often manifests in different ways than homophobia does in real life, and it was refreshing to see a writer acknowledge that. While it’s awesome to see a novel tackle important social issues, it’s also important that they’re woven into an interesting story, and Hank Green definitely delivers on that front. The novel felt very well-paced, and the mystery surrounding the “Carls” was really engaging and hinges on interesting puzzles and attention to detail. April’s emotional journey and struggle to maintain a sense of identity in the face of crafting a public persona were executed really well, and April came across as flawed and stumbling without ever being alienating. Such a strong debut has me dying to see what Hank Green writes next. Thank you for reading! 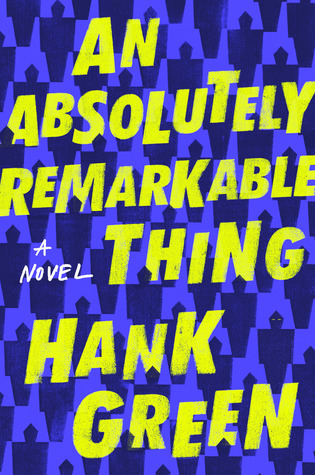 Have you read An Absolutely Remarkable Thing? Please share your thoughts in the comments! Have you read any debut novels that really surprised you? Let’s discuss!